Happy Saturday, everyone! I hope your weekend is moving along splendidly. I have a trio of somewhat non-traditional holiday cards for you today. Now, if you follow me on Instagram, you’ll know that I have been having a love/hate affair with these images all week long. I just couldn’t get them to do what I wanted them to do. I ended up having to redo them THREE TIMES just to get it right. I have the process down now, so I hope you’re interested in my final product. I had an idea in my head, and I am stubborn enough that I wouldn’t stop until I had it figured out. Three times. Haha! Top two things I learned: don’t use Fineliner masking fluid on Copics, and don’t saturate the card stock too much when using Copic markers. 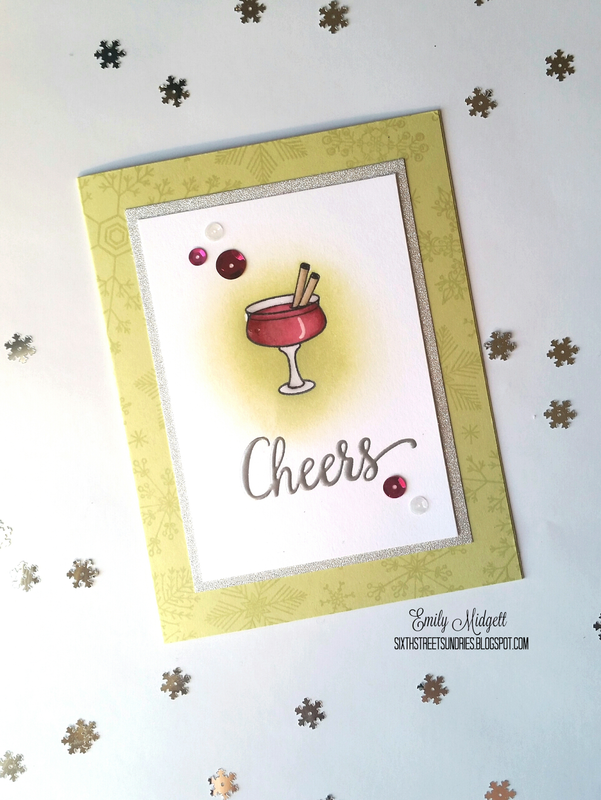 I began with the super cute-but-still-sophisticated holiday drink images from Holiday Cheers by Your Next Stamp. I stamped them all with Memento Black Tuxedo ink, then colored them in with Copic markers. Now, I don’t know if part of my problem is that I’ve been using my Zig markers so much that I kinda forgot how to use my Copics… whatever the reason, I apparently needed more practice with my Copics. Anyway, I wanted to create that sort of halo effect that Jennifer McGuire did in one of her recent videos. In order to achieve this, I used my Clear Pico Embellisher over the top of the images, then set them aside to dry. While the stamped images were drying, I created the card bases. There is something so beautifully subtle about tone-on-tone backgrounds… I just love them. They make quite a visual impact without being overpowering, you know? 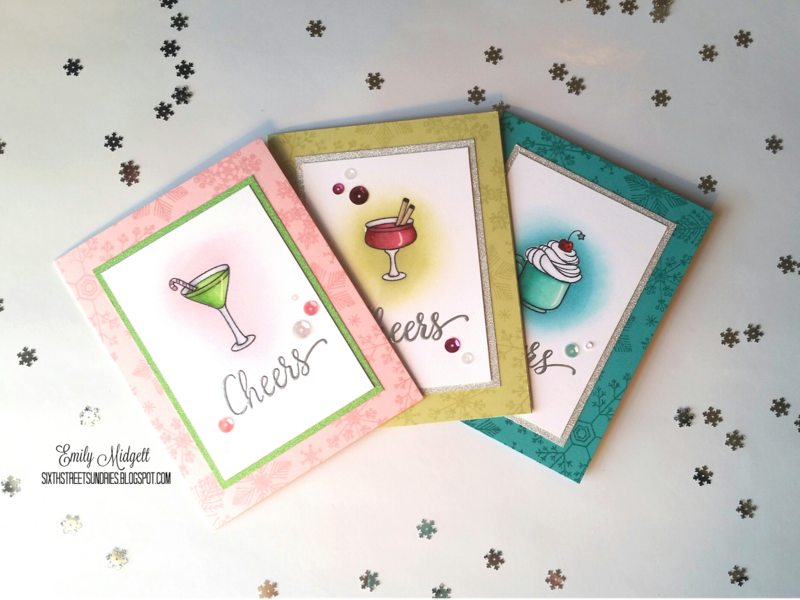 I stamped the three card bases in complementary shades of dye ink using the Hero Arts Hand Drawn Snowflake background rubber stamp. (Have I mentioned how silly I feel for being so terrified of rubber stamps? Think of how much time I’ve wasted being terrified of something so easy to work with…) When I was finished with the backgrounds, I went back to my focal panels, which were close to being dry. 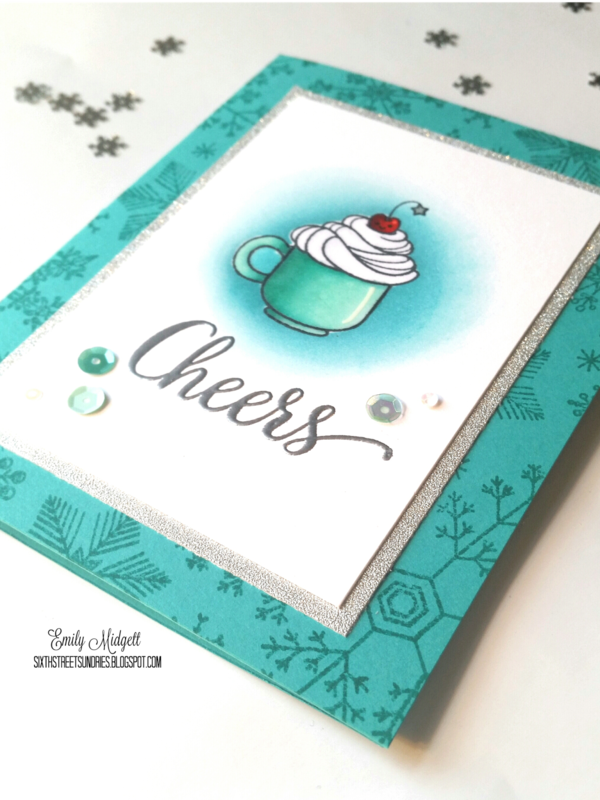 I double heat embossed the “Cheers” greeting (from the Hero Arts Holiday Greetings stamp set) using silver embossing powder. Now, some people might be able to do this free hand, but I couldn’t have done it without the help of my trusty MISTI. That thing is worth its weight in gold, people. Double heat embossing alone makes it totally worth the investment, to me at least. Look at how smooth it looks… almost like molten silver. Love. I hope you enjoyed these festive little cards! My kiddos’ birthday party is one (gasp!) ONE WEEK, and I’ve been so busy coloring Christmas cards that I’ve not gotten done NEARLY enough decorations. Be on the lookout for a post or two with some pictures from our hoedown. Have a great rest of your weekend, friends!